A Huntleigh garden is constantly changing for a fresh, new look. 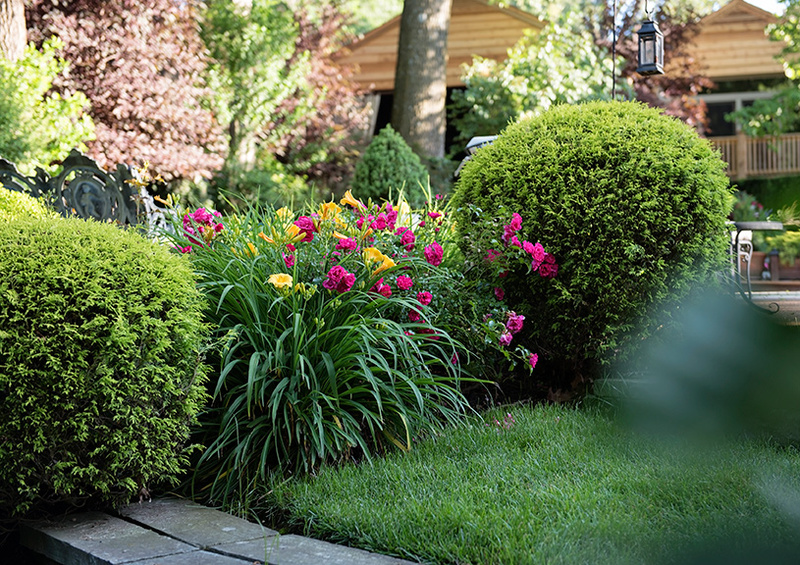 If you ever needed a testimonial to the fact that landscapes are continually changing and evolving, you would find it in this Huntleigh garden. 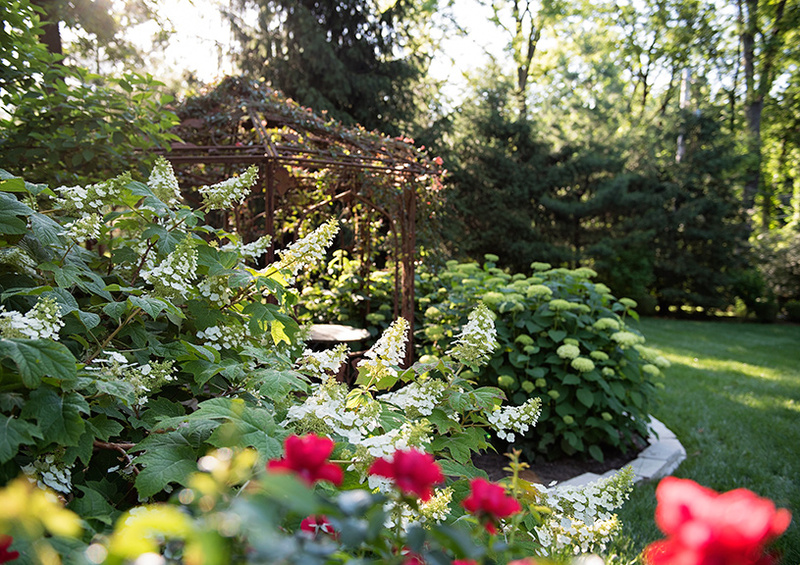 Covering more than two acres, the homeowner has always been hands-on working with Sherwood’s Forest Nursery and landscape designer Bill Minford to keep a basic outdoor core continually fresh and new. Over the past 25-plus years, the homeowner has added a rustic stone, multi-level patio that complements the sandstone facing of their ranch-style home; a small water feature; large swimming pool; a huge natural cedar pool house with both indoor and covered outdoor spaces, and an outdoor kitchen that would make Food Network chefs sit up and take notice. But that was only the beginning. 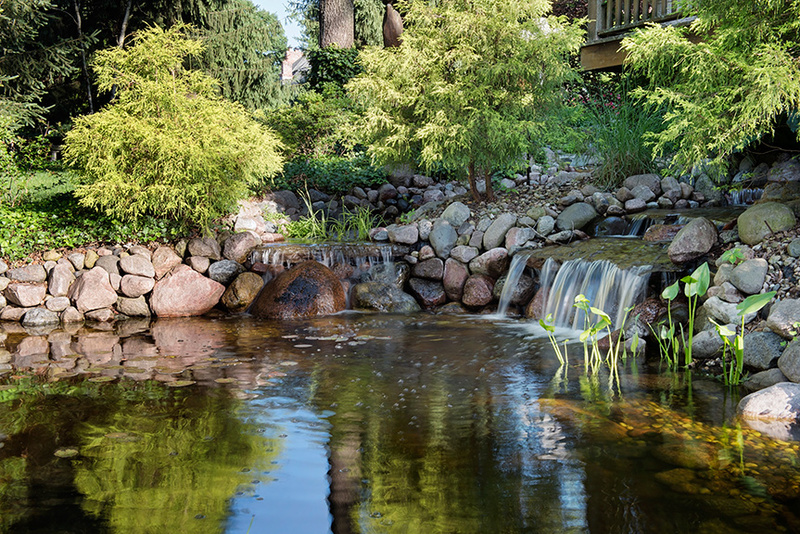 Before long a gurgling stream and a series of small waterfalls wound around the pool house deck and splashed into a restful koi pond. While those installations have a rustic, Colorado-style feel, the homeowner also has added two more formal garden areas in which glittering streams of water pour forth from old-world-style fountains surrounded by manicured boxwood hedges. Each contains ample space for visitors to sit and relax alongside the splashing water. Native shade plants dominate the woodland walk at the rear of the property, and Bill and the homeowner are continually experimenting with species that will do well in the dry, shady conditions and hold the slightly sloping grade. It is, however, the series of plant islands dotting the spacious lawn that stand as a testimonial to the true evolution of the landscape. Each island began when a mature tree reached the end of its natural life. 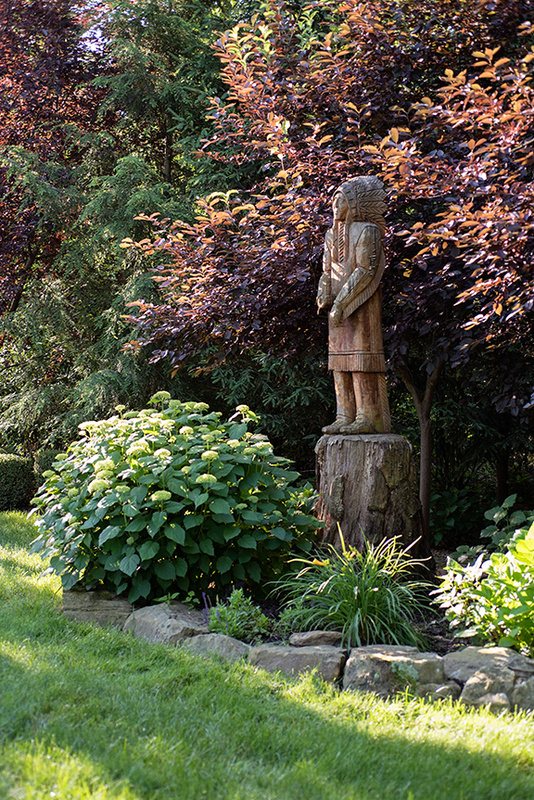 Rather than struggle to grind out a stump and try to grow grass on an area of lawn that would continually sink as the tree roots deteriorated, the homeowner saw an opportunity to create a new beautiful spot. 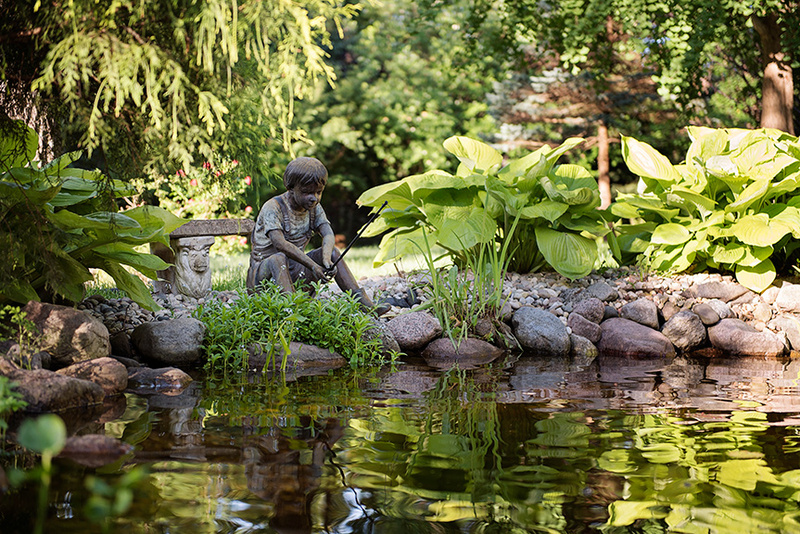 Sometimes, the stump became a pedestal for a bird bath with flowering shrubs accenting the surrounding space. Other times, he added columnar oaks to the side of a former tree site. On another garden island, he installed a gazebo. 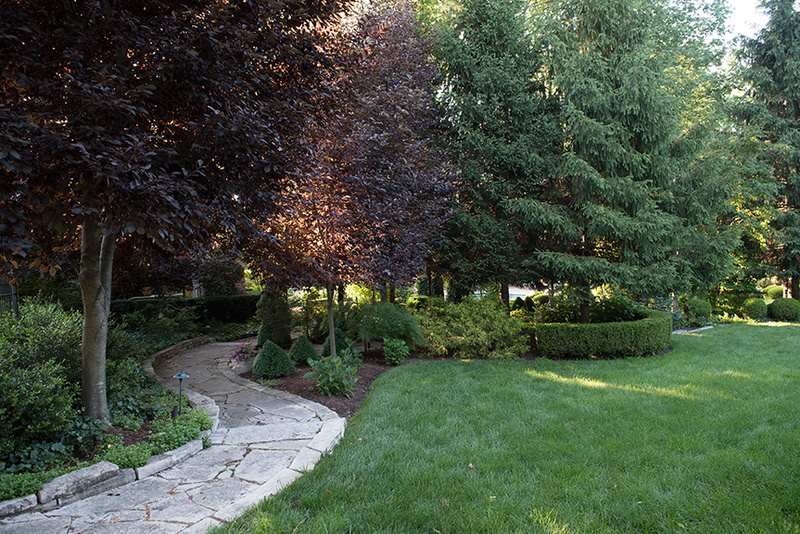 “We tried grouping shrubs around the spots where the trees had been, then adding pops of color,” Minford explains. As plants matured and grew larger, so did the islands. Then, individual islands grew together to create larger plantscapes. “It’s always an evolving situation,” says Minford. In addition to being beautiful, the garden is designed to be used. “Every Saturday he (the homeowner) hosts a lunch for family and friends who have a standing invitation to drop by and enjoy the space,” Minford explains. 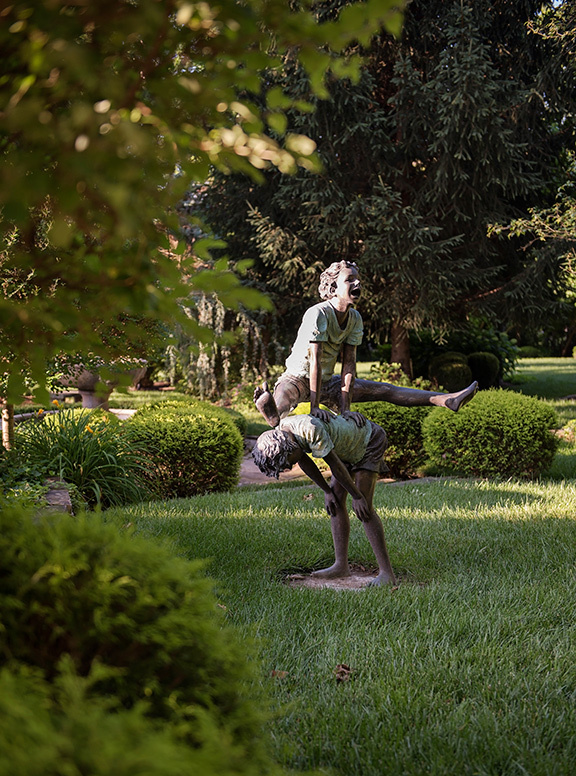 Delightful sculptures of children fishing and romping on the lawn bring reminders of the hours his grandchildren have spent playing in the lovely garden. One of the more recent projects has been a leafy tunnel of burgundy-foliage Schubert cherry trees that arch over a shady path leading down a slight hill from the house to the pool. “Just when I think we are done with the landscape, he comes up with a new idea,” Bill says with a laugh. The use of distinctive plants such as the Schubert cherries is typical of the shrubs and trees that are incorporated into the large landscape. Green foliage of the Schubert cherry emerges in the spring and serves as a backdrop for elongated clusters of white blossoms. The foliage turns burgundy/purple in summer. 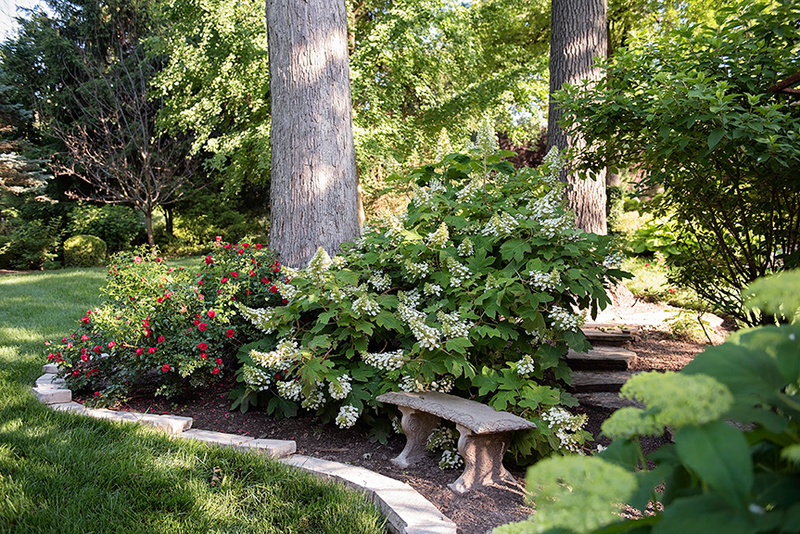 In many cases, Bill has massed shrubs to create a dramatic impact in the large landscape or used rows of plants to draw the eye through the garden. 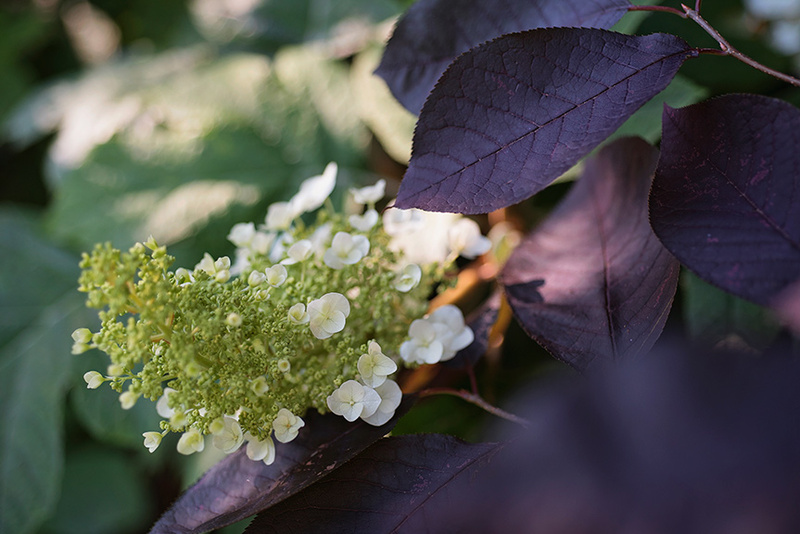 Particularly dramatic are hedges of mop head ‘Annabelle' and panicle oakleaf hydrangeas and curving golden lines of dwarf, droopy ‘Gold Mop’ cypress. 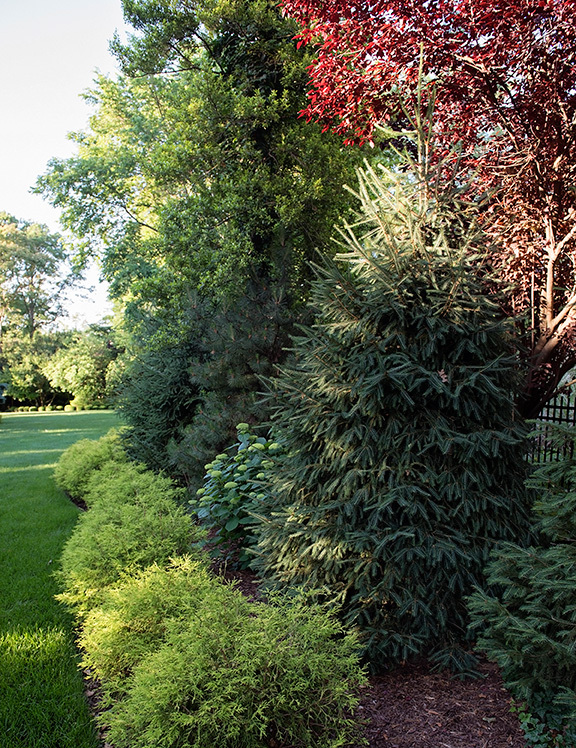 Those contrast sharply with dark green rows of crisply pruned ‘Winter Gem’ and ‘Green Velvet’ boxwoods. Both the cypress and boxwood are evergreen providing structure to the garden in winter. He has made liberal use of Japanese lilac trees that bloom in mid-May and are best known for incredibly fragrant white blossoms and a lovely spreading habit. Long-blooming, red ‘Knock Out’ roses are spotted throughout the landscape to provide pops of color during the growing season as are re-blooming, golden ‘Stella D’Oro’ daylilies. Bill cannot begin to estimate the number of trees, shrubs, perennials and annuals that had been planted in the Huntleigh landscape throughout the years. “We have tried to incorporate a number of different textures and both informal and formal areas into the garden,” he says.